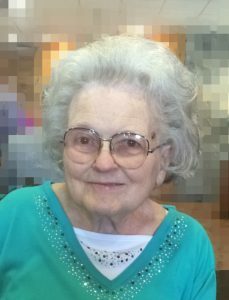 Helen Jedlicka, 80, of Schuyler, died Wednesday, August 10, 2016, at Methodist Hospital in Omaha. Mass of Christian Burial Tuesday, August 16, 2016 10:30 A.M.
Helen was born April 10, 1936, in Stanton, Nebraska to Anton and Frances(Prokupec) Dvorak. She graduated from Stanton High School and earned a Teaching Certificate from Wayne State Teacher's College. On September 25, 1956, Helen and Elmer Jedlicka were married in Stanton. They lived and farmed near Schuyler and moved into town in 1996. Helen was a member of St. Mary's Catholic Church and the Guild. Helen enjoyed traveling, playing bingo at the Senior Center, caring for her flowers, gardening and canning, polka music and especially loved time with the family and her grandchildren. She is survived by her daughter, Bert(Tim) Kaup and granddaughter Ashley, of Schuyler, son-in-law Alex Martin, grandchildren Joe and Ginger Martin, Mitchell, South Dakota, three sisters-in-law; Frances Jedlicka, Schuyler, Genevieve Dvorak and Tony Dvorak, both of Colorado and many nieces and nephews. Helen was preceded in death by her parents, husband Elmer, daughter Mary Martin, son Charles, and grandson Josh Martin.